I’ve turned into a full-on snack monster. In my previous, pre-mom life, I snacked occasionally. 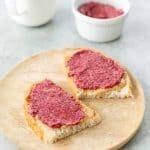 Sometimes I’d grab an apple and peanut butter on a Saturday afternoon or make myself a little hummus plate after work, to buy time before I started on dinner. Now? I need a constant, steady supply of food all day long. One arm to rock the baby, the other to fit these bites into my mouth. I’ve been working around the clock the last few weeks to try and build up my milk supply and having snacks at the ready is part of that strategy. 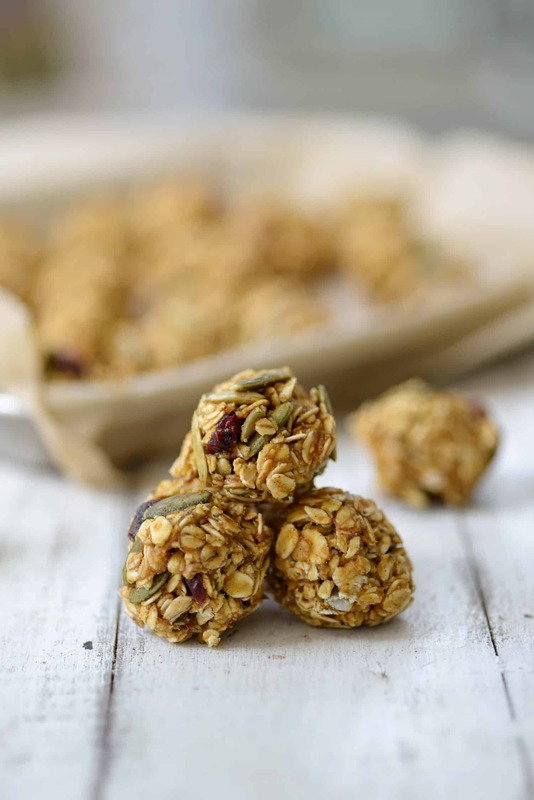 These energy balls are Fall-inspired, but still fairly nutrient-dense. Don’t get me wrong, I love homemade granola bars and such as the next gal, but most of those recipes call for a ton of honey, syrup or other liquid sweetener. I knew there had to be a middle ground; a yummy, sweet snack that tasted delicious without being the equivalent of a candy bar. As such, these pumpkin cranberry energy balls were born. 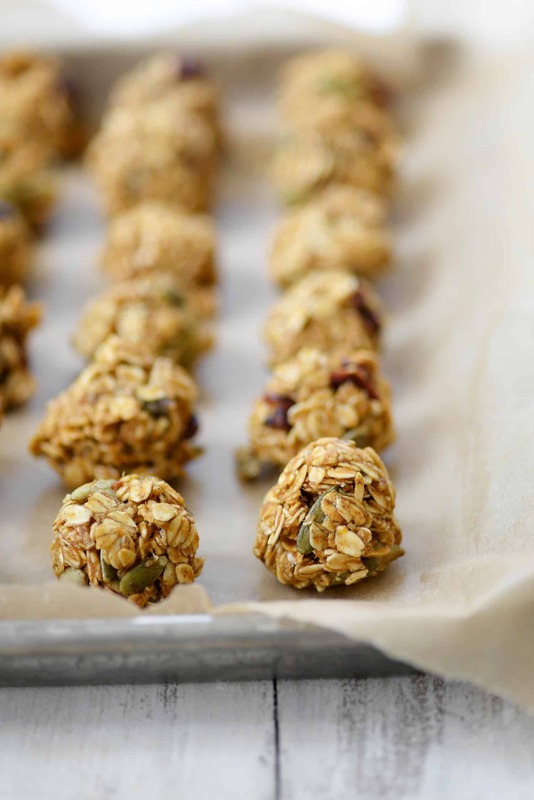 The base of these balls are rolled oats, pumpkin seeds and dried cranberries. I find that you can get away with a bit less honey/peanut butter if you use instant oats, but I prefer the texture of rolled oats instead so I opted to go with those. They are chewier and hold up well to the other ingredients. Since it’s the end of October, pumpkin was a natural choice. Pumpkin pie spices and canned pumpkin both get folded in to create these balls, along with a few chocolate chips for good measure. 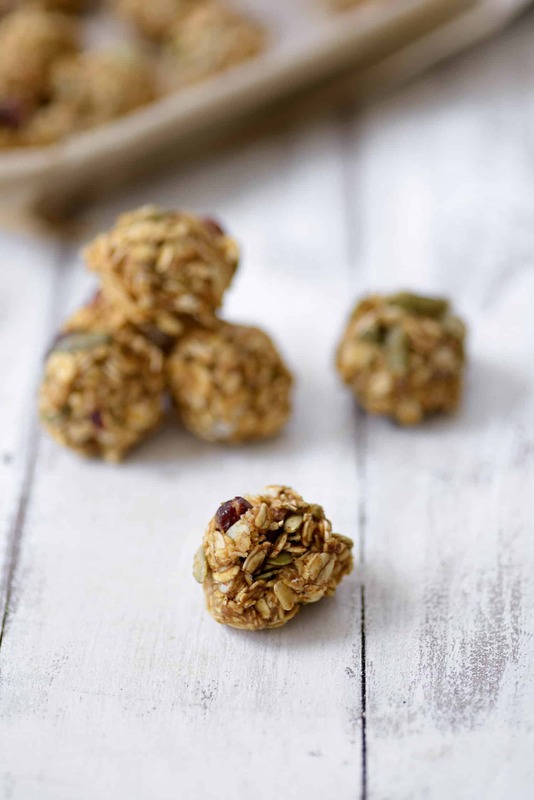 If you’re looking for a healthy, fiber rich energy ball- these pumpkin granola bites are for you! They also freeze beautifully. I recommend making the full batch and putting half in the fridge to enjoy now and individually freezing the rest. Once frozen, place in a freezer-safe container or bag, then thaw in the microwave for 10-15 seconds before eating or on the counter for 10-15 minutes. They come to room temperature really quickly! To make rolling easier, I suggest using a tablespoon scoop. Grab some batter, roll a quick ball and you’re done. If you’re looking for a more decedent treat, consider dipping the balls into melted chocolate, then placing on parchment paper to dry. I did this late one night when I was craving dessert and it completely hit the spot. I still felt like I was getting in yummy nutrients, with an extra hit of chocolate. 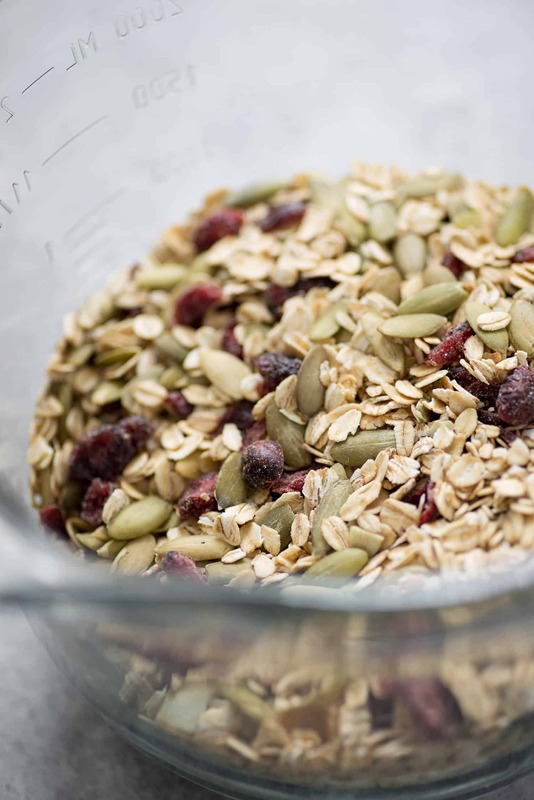 Place oats, cranberries, pepitas, cinnamon, nutmeg, ginger and salt in a large bowl. Whisk together the peanut butter, honey and pumpkin puree. If the mixture is thick and not pourable, then microwave the mixture for 20-30 seconds. A softer mixture will make it easier to mix together. Pour the honey mixture into the oats and stir until combined. Gently fold in the chocolate chips. Scoop the mixture into small bowls (I used this 1 tablespoon scoop) and place on a baking sheet lined with parchment paper. Continue with the rest of the mixture, then place the baking sheet in the fridge or freezer until hardened. This is a fab idea! I have just been experimenting with all sorts of protein balls and I am def going to add this to my rotation! I could not get these to stay together to save my life. I ended up adding an additional 1/4 pumpkin. These are a favorite! 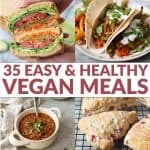 I make them every week! But I do have a question about them. They fall apart easily. It’s hard to even make them in a perfect ball. I do my best and keep them in the freezer until they are gone which is just in a few days! Haha.